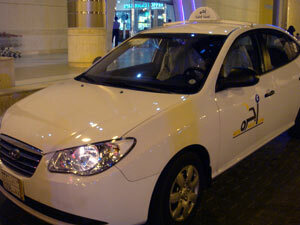 Most visitors rely on the abundant supply of white taxis found in the city center to navigate Riyadh. However, finding a taxi on the city’s outskirts and at night can be challenging. Taxi Drivers will usually default to using the meter if you do not propose a fixed price, and with a starting fare of SR 5 and the meter ticking up SR 1.60/km after the first kilometer, most metered trips within the city cost under SR 30. However, locals usually prefer to negotiate fares in advance, and this can often be cheaper than using the meter: short hops start at SR 10, a longer journey starts around SR 15.The level of English & Urdu spoken varies depending on the ethnicity of the driver. Arab drivers speak little english and are difficult to communicate with if you do not know the exact location of where you are going. Note that solo male travelers are expected to sit in the front seat, next to the driver, while women are expected to sit in the back seat. All Drivers are familiar with the major local landmarks, so they are a useful reference points, though you are expected to know your way to your final destination from there. Bring a map and the phone number of someone at your destination to call for directions if necessary.